Sri Lanka was a colourful attraction at the National Association of Travel Agents Singapore (NATAS) Travel fair 2018 which was held from 23-25 March at the Singapore Expo Hall, drawing attention from the visitors by its colourful and creative array of themes. NATAS is Singapore’s largest and most popular consumer travel fair, and this year’s event was held for the 52nd time since the inception of NATAS fairs in 1987, featuring 87 exhibitors showcasing their products over a total of 710 booths. 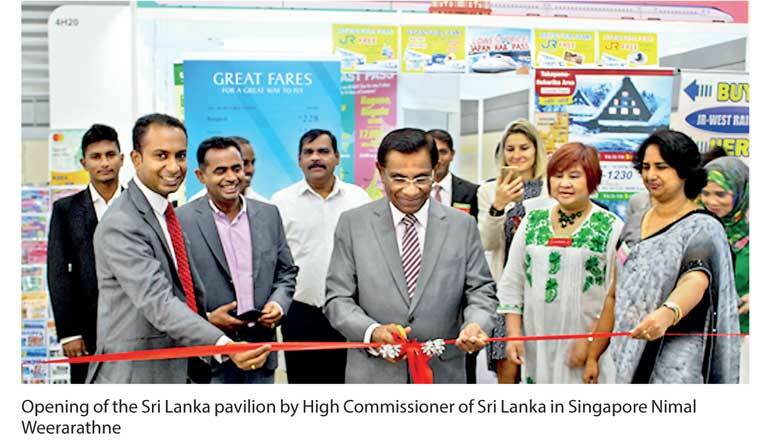 The Sri Lanka pavilion was declared open by High Commissioner of Sri Lanka for Singapore Nimal Weerarathne, First Secretary (Commercial) Nalika Kodikara, Sri Lanka Tourism Promotion Bureau Market Officer Kalpa Gunasinghe, along with other industry participants. They included Jetwing Travels Ltd., Aitken Spence Travel Ltd., Camlo Lanka Ltd., NKAR Travels &Tours Ltd., RIU Hotel & Resorts, Green Holiday Ltd., Karusan Travel Ltd., and Vilasha Travels Ltd. The visitors experienced the various holiday opportunities they could gain from visiting the island nation, complete with its cultural glamour and natural wonders. The visitors also had the opportunity to taste Ceylon tea at the tea counter in the Sri Lanka pavilion. With many travel agencies celebrating major anniversaries, NATAS Travel 2018 saw extra discounts and special perks on offer to the delight of the consumers, bringing to reality the fair’s official tagline, #RealDealsatNATAS. The 2018 event recorded a total number of 83,291 visitors, eager to purchase the best travel deals spanning tour packages, airline tickets, and cruise itineraries. Including everything under one roof, the travel fair provided a comprehensive one stop shop for visitors planning their next getaway. NATAS Travel 2018 was opened by Ambassador of Germany in Singapore Dr. Ulrich A. Sante, with an attendance of over 100 guests including dignitaries from embassies, the travel industry and airlines. He highlighted the distinct features of many German towns and cities, cementing the rich culture and history that Germany encompasses as a whole. Thus Sri Lanka’s participation at the NATAS 2018 was able to enable more Singaporean visitors to consider Sri Lanka as their next holiday destination. Up to the month of February 2018 tourist arrivals from Singapore was reported as 2,856, whilst the total number of tourist arrivals was reported as 474,542, and the majority of arrivals coming from the European region.